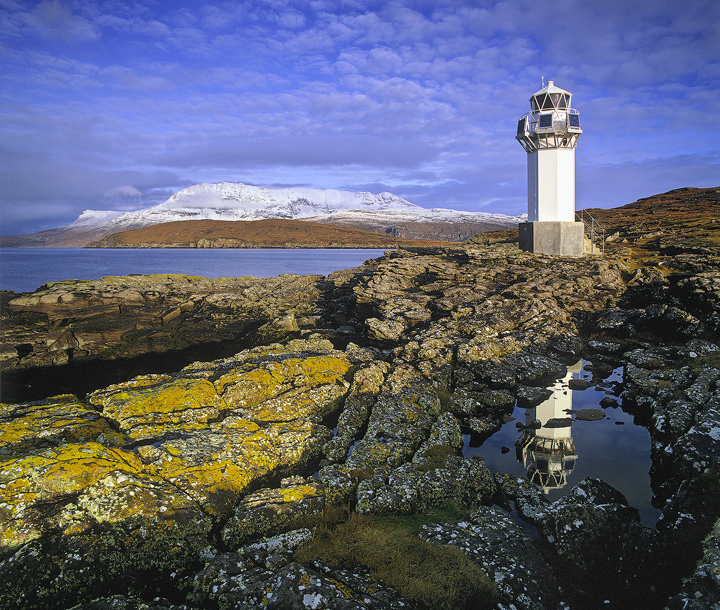 To be honest the little Rhue lighthouse is not terribly impressive. It's not big or particularly shapely nor is it manned (hardly any are), but what it lacks in stature it makes up for in setting. Rhue is a spit of land at the head of Loch Broom where it opens to the sea and the passage to the western isles and is the gateway to the fine mountains of the Inverpolly reserve. Its a great spot for fine sunsets too. Locating a small rock pool amongst the lichen clad rocks in which to reflect the lighthouse was a pleasing bonus especially with such a superb dappled sky.